Over Phaneuf's first three seasons in Calgary, he averaged almost five and a half minutes a game on the powerplay. That led to 85 powerplay points, over 54% of his 157 points. In Toronto, Phaneuf's time on the powerplay has dropped almost two minutes from what he was playing in Calgary. That has led to a precipitous drop in points. Phaneuf has scored 70 points in just under 150 games in Toronto, and only 32 of those have come on the powerplay. He isn't scoring at quite the rate he was in Calgary, but this year he's been more productive on the powerplay, which is attributable to an improvement in his own play and the Leafs being a better team in general. Remember, those Calgary teams Phaneuf played for were playoff teams in most seasons. This is only the first season with Phaneuf that the Leafs have even had a sniff at the post-season. A recent cold spell has put Phaneuf on pace for under 50 points for the first time this season, but overall, the Edmonton native's offensive game has reignited this season, although not quite to the level of his Norris nominated season, which can be partly explained by the dip in powerplay time. But another reason for a drop in points is that Phaneuf is now being used like a true No. 1 defenceman. That means real defensive responsibility. In Calgary, Phaneuf wasn't relied on to consistently kill penalties. In his rookie season, he only played 1:58 a game on the PK, which was the 11th highest on the team. The Flames eventually began using him more, playing him on the second unit, about a minute more a game. Unfortunately, Phaneuf wasn't actually a very good penalty killer in Calgary. Once the Flames trusted to use Phaneuf on the second unit, the team allowed 1-2 goals less over 60 penalty kill minutes when Phaneuf was off the ice, compared to when he was on the ice killing penalties. In Toronto, the Leafs rely on Phaneuf to play on the first penalty kill unit and he has been the Leafs' best defenceman by far. When Phaneuf is on the ice the Leafs give up over three goals less for every 60 short-handed minutes when Phaneuf is on the ice compared to when he is off. That's the best differential of any defenceman on the team. The Leafs also expect Phaneuf to match up against the opposition's best players each night, a task he was never required to do in Calgary. In fact, Phaneuf was often sheltered in Calgary, paired with good, solid veteran partners and given relatively easy defensive assignments. He was also given pretty cushy zone starts as well. In Phaneuf's big Norris nominated season he started close to 60% of his shifts in the offensive end. No wonder he notched 60 points: he had good teammates, easy competition, and started in the offensive zone most of the time. It's not hard to generate offense when you get that type of assignment (the Marc-Andre Bergeron treatment). It's much more difficult to produce offensively when your first task is defence. That's what Phaneuf has discovered in Toronto. The Leafs understand they are paying Phaneuf $6.5 million, a premier defenceman's salary, so they need to get defensive value out of that as well. In addition to playing a lot on the penalty kill and being asked to shut down the opposition's best players, Phaneuf no longer receives the primo zone starts that he once did in Calgary. Over the past two seasons Phaneuf has started just slightly over 50% of his shifts in the offensive zone. The Leafs aren't burying him in the defensive zone and expecting him to handle all the defensive responsibilities, but the coaches expect much more of him than they did in Calgary. After coming over to Toronto, Phaneuf has evolved into a much more balanced and effective defenceman. It certainly wasn't an easy task, however, as evidenced by his early struggles with the Maple Leafs. Plus, Phaneuf was a much more raw product when he was traded to Toronto than most people think. “In San Jose, we used to kind of take advantage when Dion was on the ice,” Ron Wilson told the Globe and Mail earlier this season. “We scored a lot of goals when he was on the ice." Phaneuf landed many big hits against the Sharks, but that often led him out of position, something which the Sharks took full advantage of. “He used to, wherever you’d pass the puck, if he didn’t get a hit, he’d chase the puck,” Wilson said. “We thought as long as you had your head up, you could entice him into running around a little bit." With help from the coaching staff, Phaneuf has grown into his new role on the Leafs and is making the trade with Calgary look even more one-sided than the day it was completed. If Phaneuf can pick up his pace a little in the latter portion of the season and hit 50 points, it will be more impressive than the any of his seasons in Calgary. Yes, that includes when he scored 20 goals or when he scored 60 points. That's because Phaneuf is no longer a solely offensive defenceman. In Toronto he has turned into a quality No. 1 defenceman that is relied upon in all three zones and in all situations. 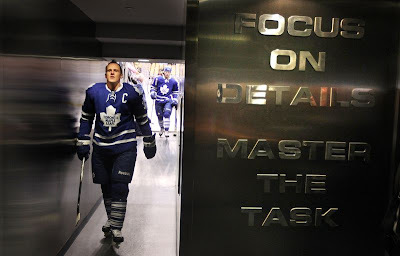 The fact that Phaneuf has undergone this radical transformation under the glare or Toronto, with the added pressure of being the captain tasked with leading the Leafs out of the darkness, makes what Phaneuf has done even more special. It's not always easy to play in Toronto, and it's especially not easy to play in Toronto when you're being molded into a completely new hockey player. Phaneuf may never again hit 20 goals or 60 points, but he's become a far superior defenceman for the Leafs. He has transformed from a one-dimensional points machine into one of the league's better two-way defencemen. The Calgary Flames didn't want to wait for Phaneuf's slow transformation, and it's Toronto that is now reaping all the rewards.